The two church graveyards are the responsibility of the Church of England. For contact details of All Saints Church, Ockbrook and St. Stephens, Borrowash please find them here. 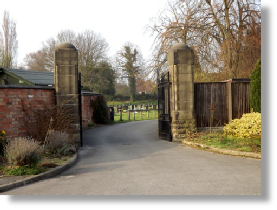 The Parish Council's Cemetery is located at Balmoral Road, Borrowash. The scale of Buriel and memorial fees (effective 1 April 2014) may be viewed from the document below. Please contact the Parish Clerk for any additional information. October to April: 08:30 to 4:00pm. For guidance regarding when someone has died please contact Derbyshire County Council. The Old Cemetery, Belmont Drive, Borrowash. There are proposals to reburish the old Belmont Drive Cemetery, Borrowash. 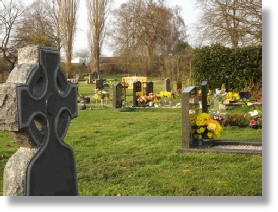 The Parish Council wishes to remind residents that it has a complete record of Burials in the cemetery until its formal closure in the late 1940's. These records can be viewed by appointment. Please contact the Parish Clerk. The Parish Council also holds full burial records for the cemetery on Balmoral Road, Borrowash but not for either All Saints, Ockbrook or St. Stephens, Borrowash. Residents requiring burial information regarding the churches will need to contact the churches themselves.